While reading Wanderville, ask your students to think about the following questions. Answers can either be written individually or discussed in groups. What do we learn about Jack’s life and family in the beginning of the book? Why do his parents decide to place him out? At the orphanage, all the children are given different-colored ribbons. This makes Frances anxious, even before she knows what the ribbons mean. Why? At the end of chapter two, Frances learns that she and Harold are being sent to Kansas. How does she feel about this? Compare this to Jack’s feelings about going to Kansas in the beginning of chapter three. Why is his reaction different from Frances’s? Describe Frances’s relationship with her little brother, Harold. Do they see the world the same way, or do they have different attitudes about life? In chapter five, Harold says he thinks they are going to “nice homes with people who can take care of us.” (Page 41). Do Jack and Frances agree? How do we know? Compare Mrs. Routh with Miss DeHaven. What do their actions say about their attitudes towards the orphan train children? In chapter six, several of the children are taken off the train at the town of Sheltonburg. Explain what happened to them, including Nell and her sister. 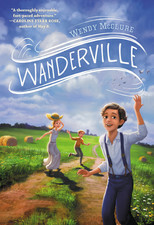 Why does Frances think Alexander is crazy when he first tells her and the others about Wanderville? How do Jack and Harold change her mind? According to Alexander, Wanderville has a “hotel,” a “town square,” and a “mercantile.” Later, Harold builds a “courthouse” with a log. Why do they feel Wanderville needs these places? Can you think of other places that might need to be part of Wanderville? At the beginning of chapter twelve, the two laws of Wanderville are mentioned. Discuss the importance of these laws. What other laws might be necessary? In chapter fifteen, Frances reads aloud a poem from her book. Why is Alexander upset by the poem? Find a scene in the book in which one of the characters—Frances, Jack, Harold, or Alexander—is reminded of his/her life back in New York. What has caused him/her to remember? How does this connection to the past affect the present? How does Jack plan to get himself and Alexander into the ranch? What happens once they get there? Some of the townspeople in Whitmore want to know why children are working at the Pratcherd Ranch. What reasons do Pratcherds give? In the final chapter, the children decide on third law for Wanderville. What is the law, and why do you think they made it? The article states that millions of poor people lived in East Coast cities in the 1800s. What brought them there, and were their lives like? Why were there so many poor and homeless children on the streets of New York and other cities? What was being done to help them? What would happen when an orphan train arrived in a town? Do you think the orphan trains were a good idea? Research on Orphan Train Riders: Many of the people who rode the orphan trains as children told their stories later in life. Using information from the Internet and library resources (See Resource List PDF at www.wendymcclure.net), have students research the lives of individual orphan train riders and share their findings in a presentation. Writing Prompt: Have students write a letter from Frances’s point of view, imagining that she is writing a friend at the orphanage in New York shortly after she comes to live in Wanderville. The letter should include the events of the story as well as Frances’s feelings about what has happened. Social Studies: Many small towns in the western U.S. were built along railroad lines in a “T Town” formation, in which a “front street” runs parallel to the train tracks and the rest of the streets run perpendicular to the tracks. Whitmore, the Kansas town in Wanderville, uses this system. Have students create a map of Whitmore showing the location of the depot, the mercantile, and other buildings and features mentioned in the book. Use the street grid diagram at www.stuhrmuseum.org/RailroadTown/tour-our-town as a visual reference for the “T Town” formation. Discuss why towns might have been built this way. Which streets were busiest? Service Learning: Using the Internet and library resources, help students find out more about assistance programs and charities dedicated to helping children. These can be local organizations or international programs such as UNICEF. Talk about places and situations where children are in need, and discuss ways that students can help, through volunteering, fundraising, or donations. For example, sites like gift.savethechildren.org list specific items that can be bought for orphanages, schools, and villages; students can choose gifts and donate or raise money to send them. Writing Prompt: In Chapter 25, we learn some of the townspeople of Whitmore are concerned about the runaways. Have students write an editorial for the Whitmore newspaper from the point of view of one of these townspeople. The editorial should suggest a plan of action to solve the problem of the runaways. Torn away from the world they knew in New York and sent to Kansas on an orphan train, three children set out on a remarkable adventure . . .
What Were the Orphan Trains? The real-life history behind Wanderville. Discussion Questions and Activities (Book #1) Teacher’s guide, with questions and extension activities. Penguin Young Readers: Teachers and Librarians Resources from Penguin Library. Wanderville History on Pinterest A Pinterest board of the historical images I found while writing the book. PDF of Additional Resources Wanderville Additonal Resources in a PDF for classroom use.